Every now and then you come across cough, cough, harshness when smoking cannabis. It doesn’t always have to be that way, if you are aware of a few things that may help you out to make your hit smoother , prior to indulging in your bowl. Getting a smoother hit actually starts with the growing, cultivating and the processing of your cannabis. You want to be sure that it was grown without chemicals and harmful pesticide sprays. You want to know that it has been completely flushed out with fresh clean water prior to it being harvested. Also, the curing process shouldn’t be rushed and the cannabis should be stored properly before it gets to your bowl. Once you are ready to indulge in your bowl, make sure that your smoking piece of choice is a clean one. Smoking out of a dirty piece can cause harshness and affect the true flavor of your bowl. Water pipes or bongs, as I like to say, are a great tool for making a hit smoother. Water is used to filter and cool the smoke before entering your airways. You can even find bongs that have ice chambers for holding ice cubes to make your hit even cooler. Be sure to change your water often and use good, clean water. Another trick I have learned to help cut down harshness would be to use a hemp wick to light your bowls with, instead of a lighter. If you don’t have access to hemp wick in your area, it is really simple to make. Use all natural non dyed hemp string and all natural beeswax, cut the string, melt the wax, dip the string, dry and then wrap into usable wick. Some find that using a vaporizer helps with the harshness of cannabis because they can control the temperature of their hit at any time. You can find vaporizers that are home units, so you can have a stationary place to choose to indulge. They also make many brands and types that are portable and very easy to use. Most are rechargeable and will burn flowers to concentrates with a push of a little button. There are many factors involved with making your hits smoother, from the growth of the cannabis, to the dusting of your bowl. 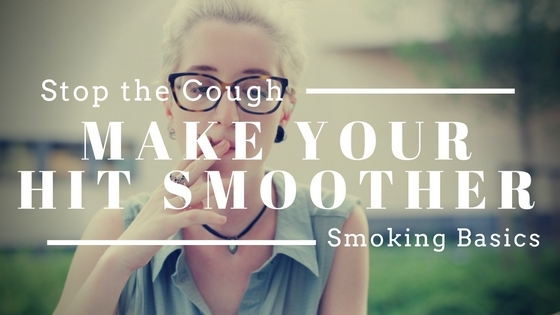 With a few of these tips in your mind, hopefully your next smoked bowl will be puff, puff, pass, instead of cough, cough, harsh. Marijuana and Yoga: Amazing Pairing or Just Hype?